Whenever we need to find any sort of services or offers for your kids, we go online in order to come across all needed data within the shortest period of time. While browsing the web, you can compare services and prices from different companies, thus selecting the best entertainment or educational center for your kids. If you run a child care center and want your project to stand out from the competition, then you need to create an impressive web resource in order to engage a wider audience and make people trust you. The web offers a wide choice of ready-made designs for kids-related online projects. ThemeRex themes stand out from the competition owing to their impressive functionality and a wide choice of extensions that you can use to boost the performance of your site. Moreover, it’s easy to work with WordPress designs even if you have little to no coding or web design skills. 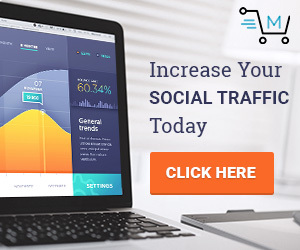 The themes that you can find listed on this page are compatible with all popular drag-and-drop page builders that allow you to modify the layout of your future website in the intuitive visual mode. 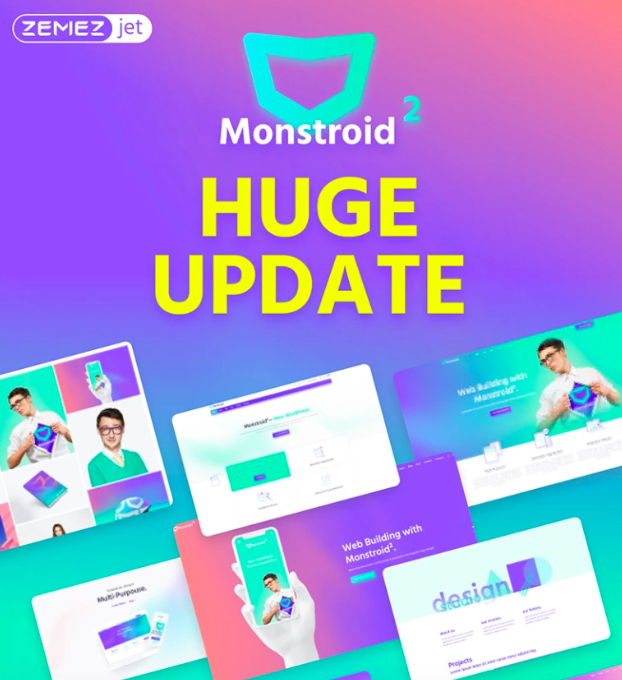 Whatever sort of changes you need to apply to the themes’ look and feel, you can manage this by means of additional pages, layouts, and design elements that are included in the themes. All themes are mobile-friendly and Retina-ready solutions. All of them are built using WordPress 5.0. This means that they are also GDPR and Gutenberg compatible. Valid code and SEO-friendly layouts let you optimize your site’s content and promote it just the way you need. Browse the showcase and select WordPress themes that match your kids and children online projects. All of them include free live demo versions and detailed documentation folders. Tediss WordPress theme is a modern and alluring WordPress theme that is perfectly suited for the launch of contemporary childcare, preschool, kindergarten, nursery, kids education, and other kinds of web projects for kids. It’s based on Elementor page builder. The theme is quick and effortless to modify without any special coding skills. It features a premade blog and news sections. Built-in social sharing options welcome web users to join communities of social media fans and spread the word about your offers with a few clicks. 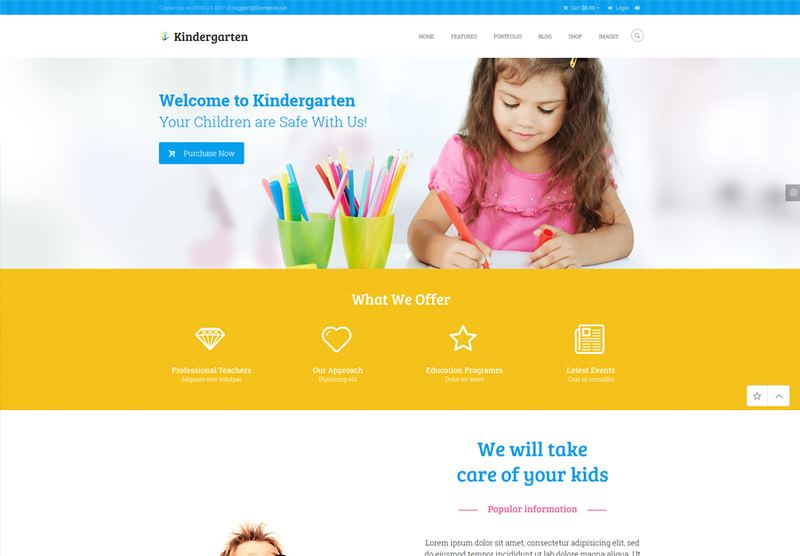 Kindergarten is a colorful and catching WordPress theme that is perfectly suited for the development of contemporary childcare, day care center, preschool, craft school, nursery, education or training center website. It includes 5 kids related topics, 5 headers, and 10 additional layout styles. There are 100+ ready-made shortcodes and widgets included. It’s easy to adjust the theme according to the needs and demands of your children-related web project owing to the availability of online layout and color scheme editor. The theme also features a pre-made WooCommerce store. This allows you to enhance your website with eCommerce functionality. The theme is made to be fully compatible with a range of WordPress plugins like WPBakery. There are several header styles, blog styles, as well as such stunning sliders as Royal, Revolution, Swiper, and Flex. Kids Planet WordPress theme is apt for a range of children-oriented websites, including childcare, daycare center, children art, and craft school. 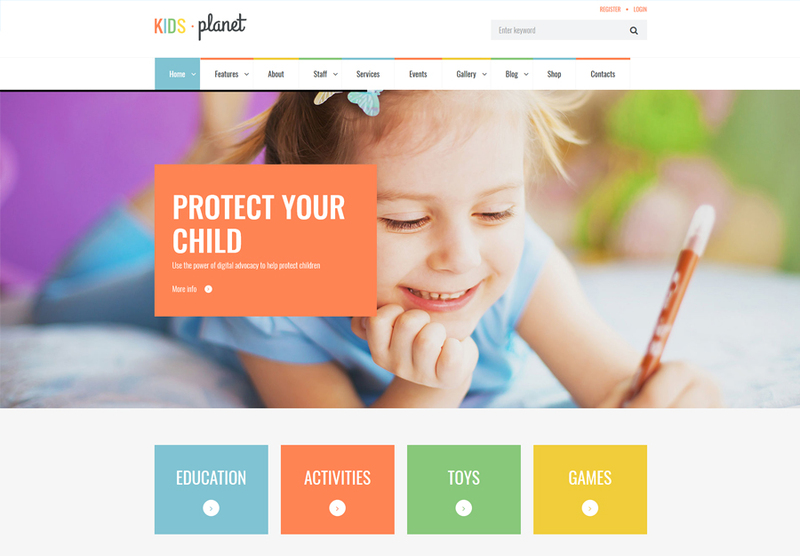 The theme contains a set of premade topics like kids care, kids health, kids store, and landing page. The theme contains premade services and events management functionality. There are colorful blog and gallery layouts available in the theme’s download package. This is a multipurpose web theme featuring 3 homepage layouts with Revolution Slider and custom areas to showcase your skills and achievements. The theme includes WPBakery Page Builder plugin that lets you create custom layouts without the need to modify the source code. 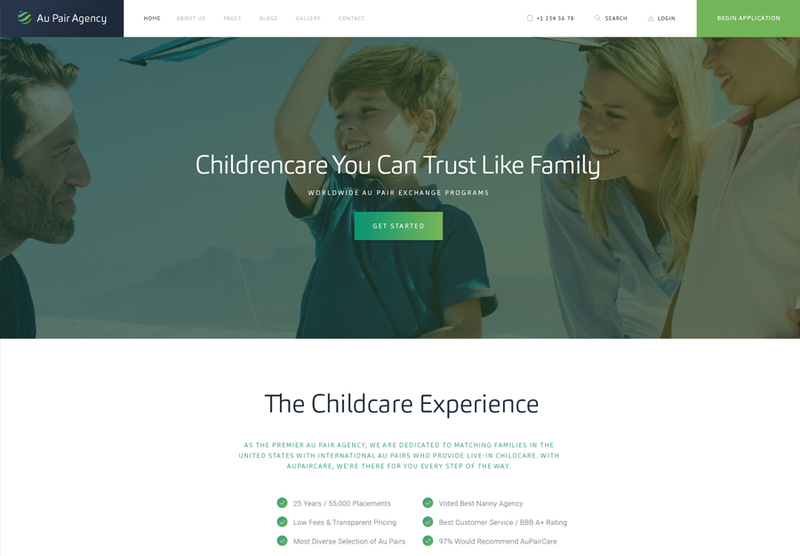 This multi-purpose WordPress theme is a fully responsive ready-to-go web solution that is great for building childcare company, preschool agency, kindergarten, and other kinds of websites for kids. It includes 4 ready-made topics and 4 premade header and menu layouts Online Booked Appointment and Events Management plugins are integrated into this theme. It easier to deliver the needed presentation of your services and company data by means of premade shortcodes, pricing tables, services, and products. The theme is made to be fully compatible with WPBakery Page Builder, WPL, Revolution Slider, WooCommerce, and a number of other popular WordPress plugins. The theme contains stunning header layouts, a range of blog styles, several cool sliders, and other theme options that will help you create a perfect presentation of your kids center website. 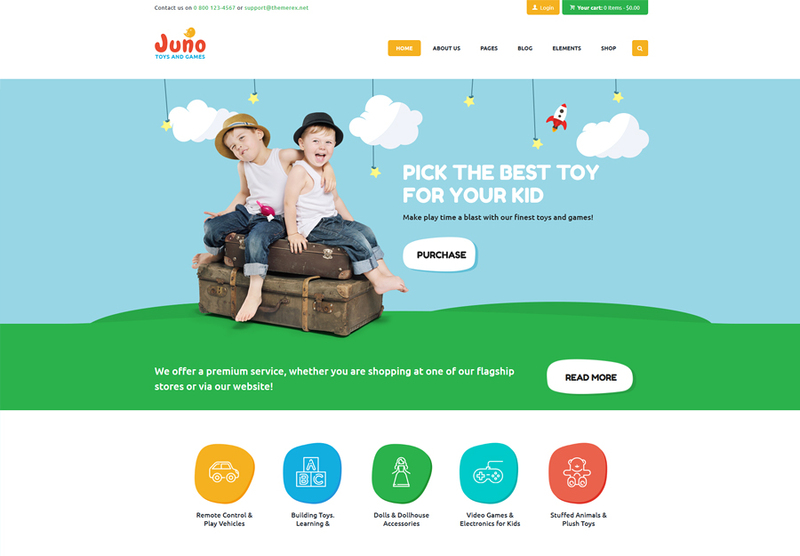 Use Juno WordPress theme for a quick start of kids toys and video games sites. A fully editable layout of the theme is well-suited to be used for the launch of children presents, baby clothing, and surprise accessories shops. The theme runs on WordPress 5.0. It’s made to be fully compatible with Gutenberg content editor. It’s quick and easy to navigate the theme’s pages and find all necessary pieces of data owing to the built-in fully customizable MegaMenu. It contains pre-made blog and news sections. A fully responsive layout of the theme adjusts all pieces of your site’s data to a range of screen sizes. It’s also based on WPBakery Page Builder. The theme is compatible with such premium plugins as Essential Grid, Swiper Slider, Revolution Slider, WPML. 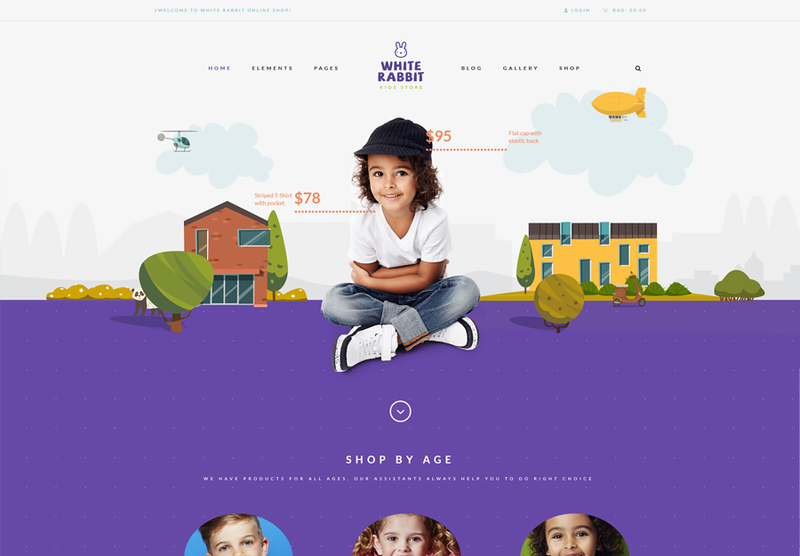 White Rabbit is a responsive colorful and visually attractive solution that perfectly suits kids toys web stores. There are 4 beautiful homepage layouts included in the theme’s download package. The theme contains a powerful set of shortcodes for a range of occasions. It includes a set of pre-made pages for store, about, team, contacts, services, gift cards, and gallery. Thanks to the full WooCommerce compatibility, the theme makes it quick to launch a fully-fledged eCommerce site on its basis. It is packed with lots of pre-designed pages to display your main services, your store’s range, its gallery, and its news, etc. 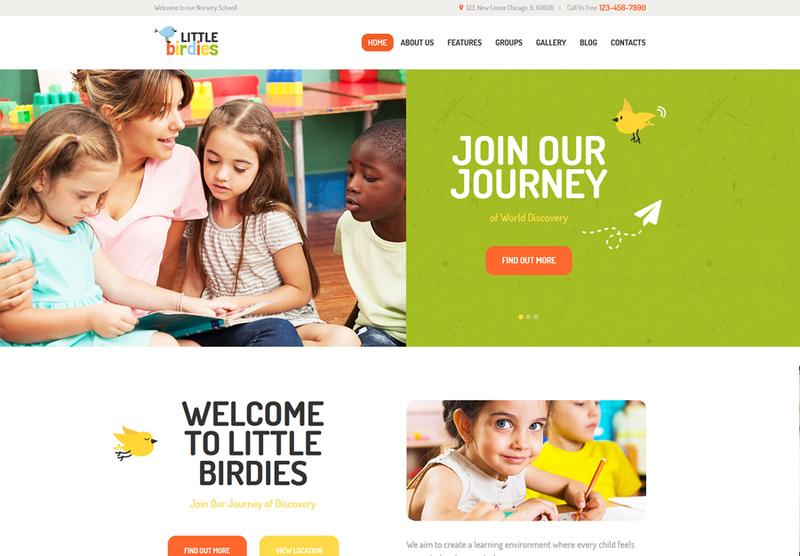 Little Birdies is a modern and refined WordPress theme that is perfectly suited to be applied for the launch of a range of children-oriented websites. A fully editable layout of the theme can become a solid foundation for your childcare agency, daycare center firm, preschool company, kindergarten, children art, and craft school sites. This is a responsive and multipurpose WordPress theme featuring an impressive Revolution Slider and a custom area to present your skills and professional achievements. The theme is enhanced with WPBakery Page Builder plugin, which provides for the code-free modification of the theme’s layout. It’s quick to launch a website out-of-the-box due to the availability of a range of re-designed pages for main services, gallery, news, about, and other sections of your site. 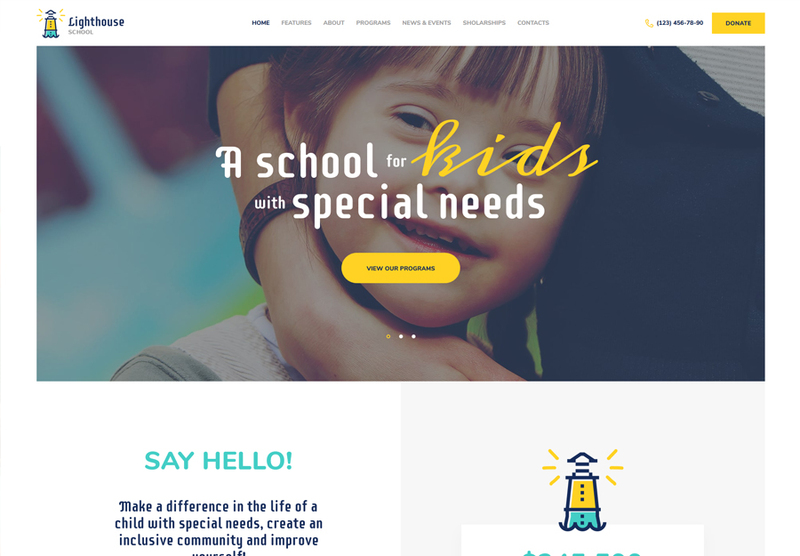 Here is a clean and well-structured WordPress theme that is well-suited to be used for the launch of websites of schools or kindergarten for kids with special needs. The theme is made to be fully compatible with ThemeREX donation plugin to raise funds. The theme also supports Events Calendar plugin that will keep your audience updated on the calendar of upcoming events and meetings. The theme is 100% responsive and Retina Ready. 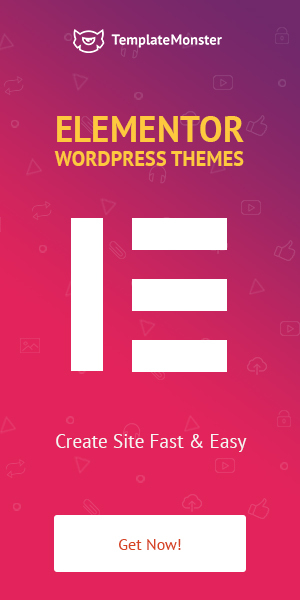 It’s compatible with WPBakery Page Builder, Woocommerce, Slider Revolution, Essential Grid, Contact Form 7, Instagram Feed, MailChimp, and other popular WordPress extensions. 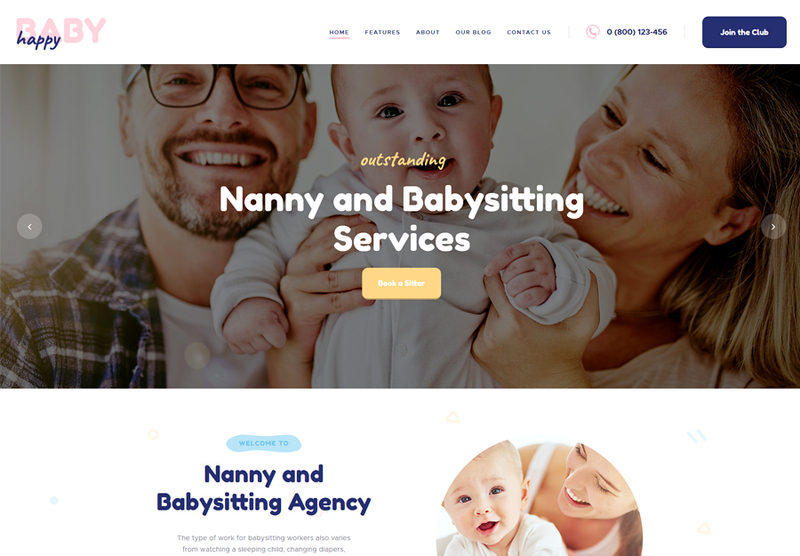 Happy Baby is a child care oriented WordPress theme that is perfectly suited to be used for the launch of websites of nurses company, nanny agency, babysitting online network, nannies bureau, mom’s blog, preschool, kindergarten, and other purposes. It’s made to work flawlessly with a range of popular WordPress plugins like WPBakery (aka Visual Composer), Revolution Slider, Essential Grid, WooCommerce, Contact Form 7, and MailChimp that will help you work easier and more effective. Happy Baby is a fully responsive WordPress theme featuring 3 pre-made layouts, a range of shortcode, and blocks that will help you boost your site’s content presentation. 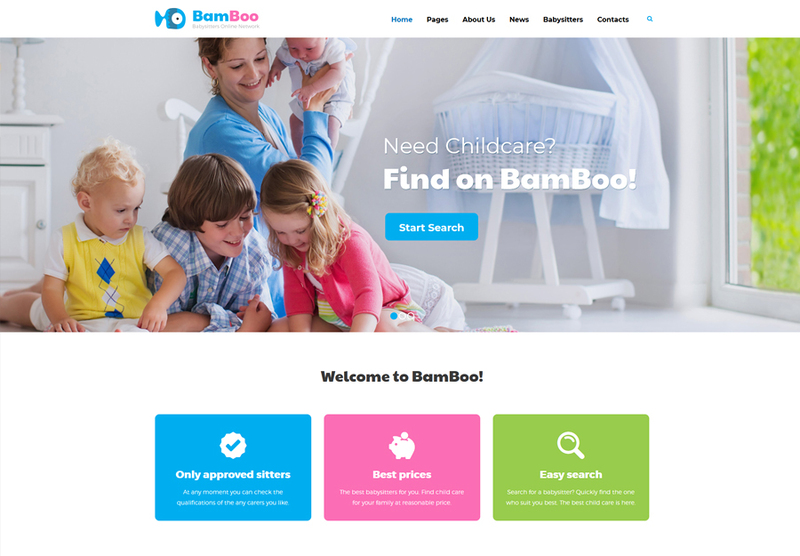 BamBoo is a colorful modern and impressively functional WordPress theme that’s suited to be used for building childcare-related sites. There are advanced contact and appointments forms included in the theme. 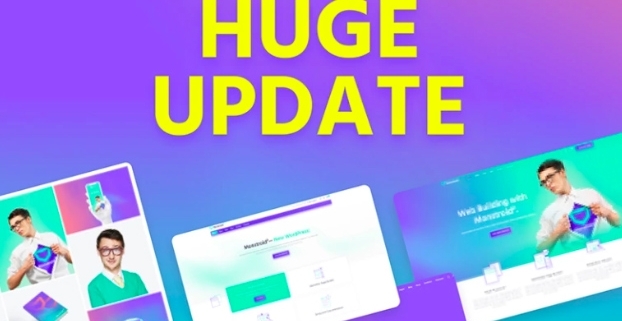 There are a number of usable prebuilt pages for About, Team, News, and other pieces of information that can be presented on your site. The theme features impressive gallery and posts layouts. Its’ made to be fully compatible with WooCommerce plugin. Also, the theme supports a range of other popular plugins and tools in the WordPress community. The theme is 100% responsive, Retina-ready, and SEO-friendly. The download package contains a folder with detailed documentation that’s essential for worry-free customization of the theme’s layout. SevenHills WordPress theme features an outstanding design that is apt for Summer Camp or Outdoors Activities websites. There are 2 ready-to-go homepage layouts letting you pick the perfect match for your venture. The theme contains appointments booking plugin and a working contact form. Thanks to the full WooCommerce compatibility, you can sell certificates, tickets, and other stuff right from the pages of your site. 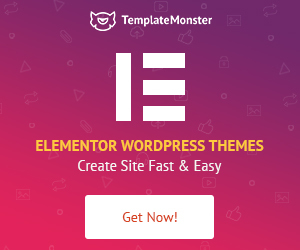 The theme also works well with a number of other popular WordPress plugins like Revolution Slider, Essential Grid, and WPBakery Page Builder. The theme is 100% responsive and Retina-ready. 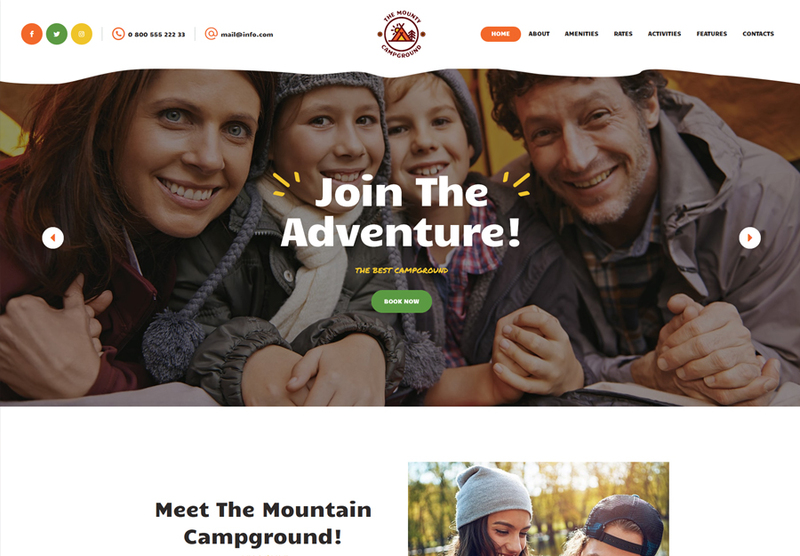 Here is a stylish and alluring WordPress theme that’s built for campgrounds, camping, children camps, and kids activity center company websites. A fully editable layout of the theme is flexible enough to be used for any water camp, art camp, nature camp, or hiking trip project. The theme includes a number of pre-built pages like to reveal About, Amenities, Rates, Activities, Camping, Services, Products, and other kinds of information. You can also enhance your site with eCommerce functionality due to the theme’s compatibility with WooCommerce plugin. 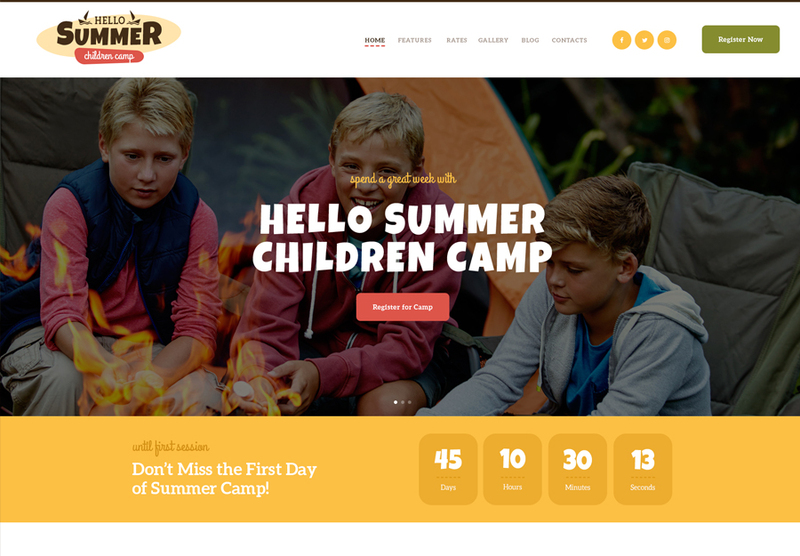 By means of Hello Summer WordPress theme, you can create usable and engaging websites for children camp and kids activity center sites. This is a perfect ready-to-go solution for children communication classes and children blog. All elements are fully editable. Online Appointments booking & management are integrated to let you schedule meetings with your clients. There are a bunch of shortcodes, galleries & blog layouts included in this responsive WordPress theme. All elements of the theme are built to match all contemporary SEO guidelines. 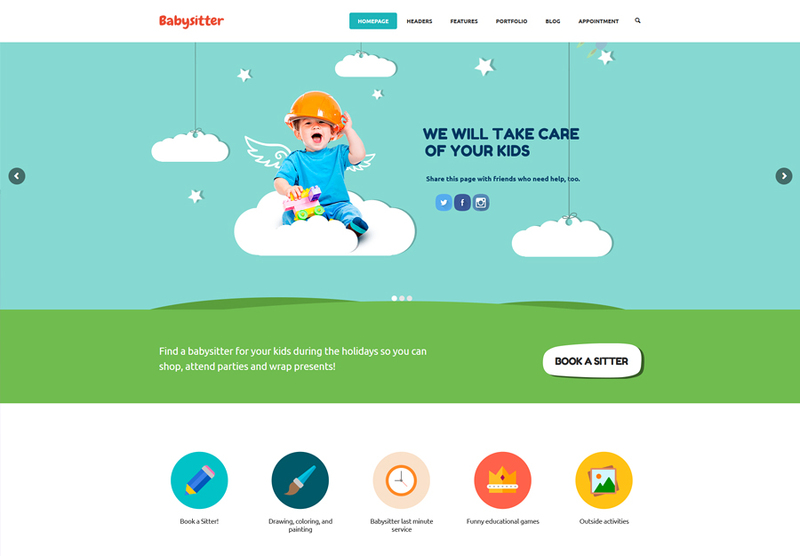 Use this ready-made design to create websites for babysitter agencies, nanny firms, professional nurses agencies, etc. This is a ready-to-go web solution containing a bunch of tools and features that are essential for topic-specific online projects. For example, the theme contains application and contact forms, pricing tables, and a series of pre-designed pages. The theme is fully compatible with WPBakery, WPML, BuddyPress, bbPress, Revolution Slider and Contact Form 7. It’s fully responsive and SEO-friendly, which will help you adjust your website for higher rankings in search engines. 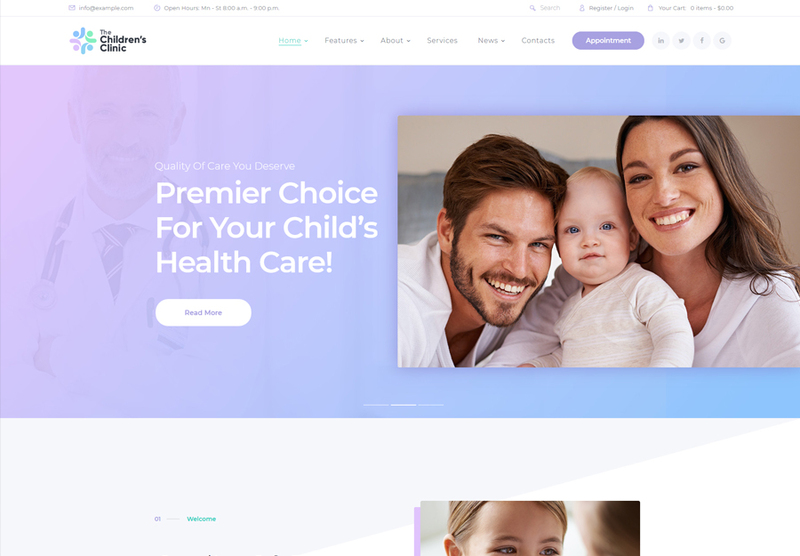 The fresh and refined layout of this WordPress theme is the perfect choice for the launch of kids clinics and pediatric hospital websites. The theme features a fully editable layout that is ready to adjust to match the purposes of a range of medical and healthcare project. In order to save your time on the layout customization, the theme includes a drag-and-drop page builder. A custom theme options panel is included to make your site really powerful and truly functional. The premium-quality Revolution Slider is integrated into the theme. It’s compatible with Booked Appointments plugin that allows you to arrange meetings with your clients right n the pages of your site.